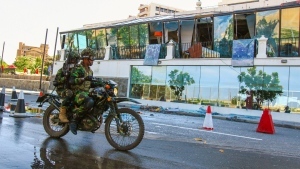 French President Emmanuel Macron said after the French capital's fire chief announced the emergency response had changed into a monitoring and mop-up operation, "The worst has been avoided although the battle is not yet totally won." Paris police said there were no deaths so far and the origin of the fire was unknown. French media quoted the Paris fire brigade saving the fire is "potentially linked" to a 6 million-euro ($9.06 million) renovation project on the church's spire and its 250 tons of lead. An AP reporter at the scene of Monday's fire says the roof at the back of the cathedral, behind the nave, was in flames and yellow-brown smoke and ash fill the sky. The fire chief in Paris said originally that it was unclear if city firefighters would be able to keep a fire at Notre Dame from spreading and causing more destruction. 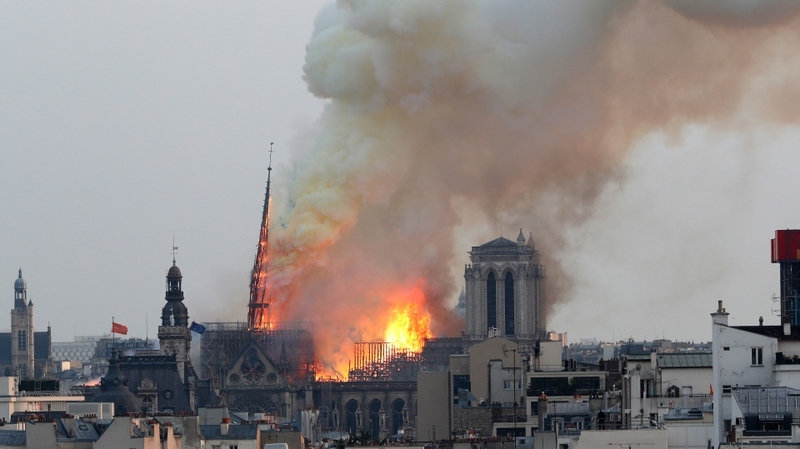 Flames reached one of Notre Dame's towers and brought down the church spire that extended 96 meters high. Emmanuel Macron has promised to rebuild Notre Dame Cathedral and says he is seeking international help to restore the Paris landmark.